① The Rajya Sabha passed this amendment bill 2nd March 2016. ② The bill will enhance compensation for air travellers in case of death, injury,1oss of baggage and even inordinate delay in flights. 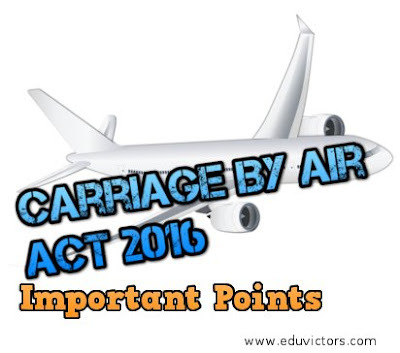 ③ The bill amends the Carriage By Air Act 1972, which regulates carriage by air and gives effect to Warsaw Convention 1929, Hauge Protocol 1955 and Montreal Convention 1999. ⑤ The bill was introduced by Civil Aviation Minister Mr P Ashok Ganpathi Raju in Lok Sabha on Aug 7 2015. It empowers Union Government to make rules to carry out provisions of the Act. ⑥ It is expected the bill would bring legistlative character to international character with respect to compensation for air passengers.